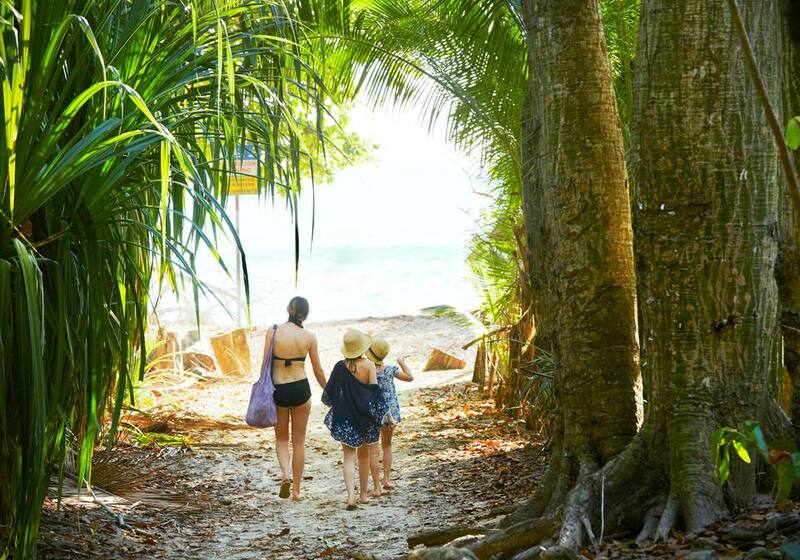 Planning a family vacation in Costa Rica? Among your first decisions will be where to go, what to do, and where to stay. Looking for the perfect place to stay? The following resorts roll out the red carpet for families with special amenities for kids of all ages. With its hot springs, fine dining and spectacular views of the Arenal Volcano, this gorgeous inland resort is an upscale, relaxing home base for a family adventure. You don't need to leave the property for excursions include river tubing and horseback riding, and there's also an on-property animal sanctuary that is home to big cats, monkeys, sloths, and more. In the town of Quepos on the fringe of Manuel Antonio National Park, this lovely boutique-style resort offers suites overlooking the Pacific Ocean, two pools, a nice beachfront, and a knowledgeable staff that can set you up with a local zip line tour or an expert guide to lead a hike through Manuel Antonio. Can't decide between the rainforest and the beach? Get the best of both worlds at this mid-size boutique hotel just outside the Manuel Antonio National Park that has a great pool, private cinema, butterfly garden, a complimentary beach shuttle, beautiful views of the Pacific and plenty of monkeys and sloths to spy from your balcony. Nearby activities include zip lining, mangrove tours, and whitewater rafting. Nestled on an 843-acre private rainforest reserve on the pristine Savegre River, this upscale eco-lodge delivers the kind of wildlife-rich glamping vacation many families hope to find in Costa Rica. Toucans and monkeys can be spied on the property, and there's a pool with a water slide, plus rafting and kayaking nearby. Accommodations are luxury safari tents (with plumbing), and meals are included in the rate. Home to the largest swimming pool in Central America, the JW Marriott Guanacaste Resort and Spa is an upscale resort where both parents and kids can get the kind of vacation they want. There is a beach club, biking, and jogging trails, 18-hole golf course, a children's club, and a slew of recreational activities and a beautiful spa. As you might expect from Four Seasons Costa Rica, luxury is at the forefront at this plush property occupying a prime section of the 2,300-acre Peninsula Papagayo in Costa Rica's northwest Guanacaste Province along the Pacific. Accommodation options include guest rooms, suites, and villas, and there are multiple pools, tennis, golf, a nice beach, and a complimentary children's program for kids ages 4 to 12. The all-inclusive Barcelo Tambor Beach Resort is one of the larger hotels in Costa Rica, offering 402 rooms and suites (the largest of which can sleep six people) with balconies and TVs. There is a lovely beach and multiple pools, including one just for little kids with water spray features, plus a kids club for ages 4 to 12 and a teen club for ages 13 to 17. The resort also offers mini golf, water sports, tennis, and a climbing wall. Looking for a home away from home where you can kick back and relax for an entire week? Oceanfront hotels are surprisingly rare in Costa Rica due to conservation laws, but this plush resort gives guests direct access to a beautiful private beach and multiple pools. The other factor that makes this property a win for families is its spacious octagonal Buena Vista Villas, which are wonderfully set in the surrounding rainforest and feature full kitchens and laundry machines. Located just five minutes from Juan Santamaria International Airport (SJO), this reliable DoubleTree property offers a convenient and comfortable stay on a first or last night in Costa Rica. Standard guest rooms have two queen beds while suites range from oversized junior suites to two-bedroom suites with a living room and two bathrooms. Families staying in suites also have access to the executive lounge, which serves complimentary breakfast and afternoon appetizers every afternoon.